A growling or humming noise when driving down the road is a sign of potential trouble. If you swerve the steering wheel and the noise changes, the culprit is probably a wheel bearing. Usually, this only occurs on one side. Determine which side has failed by lifting the front of the vehicle and spinning the wheels by hand. Often, you can hear the noise in the side that has failed. The failed hub and bearing may also feel loose when you grab the tire by the top and bottom, and pull in and out. Dodge Caravans use a sealed hub and bearing. This means that the only replaceable parts are the wheel studs. The bearing cannot be lubricated, and in case of failure, the complete hub and bearing must be replaced. Raise the vehicle using a suitable floor jack. The correct lift points for the Dodge Caravan are located under the floor pan and body. They are marked by small downward pointing triangles. Place the jack under this point, and lift. When finished lifting, place a safety stand in a position where it will support the vehicle if the jack fails. Use a wheel nut wrench to remove the five wheel nuts. Remove the tire and wheel assembly from the vehicle. You may want to enlist a helper to hold the brake pedal to make the removal process easier. Remove the cotter pin from the end of the axle shaft. A cotter pin is a thin piece of metal that looks like a sewing pin, with a rounded piece at the top. The bottom part is split and bent both ways to prevent it from coming out. Remove the nut lock and spring washer as well. While a helper holds the brake pedal, remove the axle shaft nut on the end of the axle shaft. Remove the brake caliper mounting bolts on the back side of the steering knuckle. 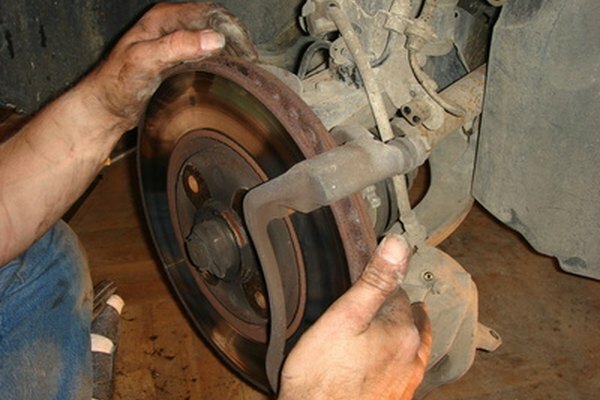 Gently remove the brake caliper from the rotor, and support its weight with a coat hanger or bungee cord. If the brake rotor has never been off the vehicle, look for a small clip on one of the wheel studs. Remove this clip with pliers, and discard it. You will not need to re-use this--it is for assembly-line purposes. Slide the brake rotor off the hub and bearing. If the rotor is stuck, apply penetrating lubricant to the area where the brake rotor meets the hub and bearing. Let it soak for 30 minutes, and try again. If it is still stuck, tap it gently with a hammer around the area where you sprayed penetrating lubricant. If the rotor still will not come off, you may tap the back of the rotor gently with a hammer to remove it. Push in on the axle shaft end, to disengage it from the splines that are part of the hub and bearing assembly. On the back of the steering knuckle, there are four hub and bearing mounting bolts. Using a socket wrench, remove these four bolts. Be careful not to come in contact with the tone wheel on the axle. The tone wheel is a round piece on the axle shaft with teeth cast in it. Remove the hub and bearing assembly from the steering knuckle. Clean the mounting surface on the steering knuckle carefully. Install the hub and bearing onto the splines of the axle shaft. Move the hub and bearing into the steering knuckle, until it is squarely seated on the knuckle. Install the four hub and bearing mounting bolts from the back of the steering knuckle. Tighten these bolts in a criss-cross pattern, to 45 foot-lbs. of torque. Place the brake rotor on the wheel studs, pushing it back completely onto the hub and bearing assembly. Install the brake caliper and adapter assembly onto the brake rotor, pushing it down until the two bolt holes in the caliper align with the holes in the steering knuckle. Install the two bolts from the inside of the steering knuckle. Tighten these two bolts to 125 foot-lbs. of torque. Install the hub nut on the end of the axle shaft. Use a helper to hold the brake pedal. Tighten the axle nut to 180 foot-lbs. of torque. Install the spring washer and nut lock onto the axle nut. Install a new cotter pin through the hole in the end of the axle shaft, and split the cotter pin at the end, bending the ends apart, to secure the axle nut. Install tire and wheel assembly. Tighten the wheel nuts to 100 foot-lbs. of torque, using the helper to hold the brakes as necessary. Remove the safety stand, and lower the vehicle. Have a wheel alignment performed in case disturbing the hub and bearing assembly caused a change in wheel alignment. This will help prevent premature tire wear. Always be safe when lifting a vehicle. Be certain that the vehicle is supported by the safety stands when the jack is in use. This repair requires disassembly of brake components. Be certain that you reassemble them correctly. If you have any doubts about your ability to do this, seek the assistance of a qualified person. Failure to do this correctly could result in brake failure. Damaging the tone wheel on the axle shaft can cause damage to the anti lock brake system, causing the anti lock braking light to illuminate. Use extreme care not to cause damage. The fasteners in this repair need to be tightened to correct torque. 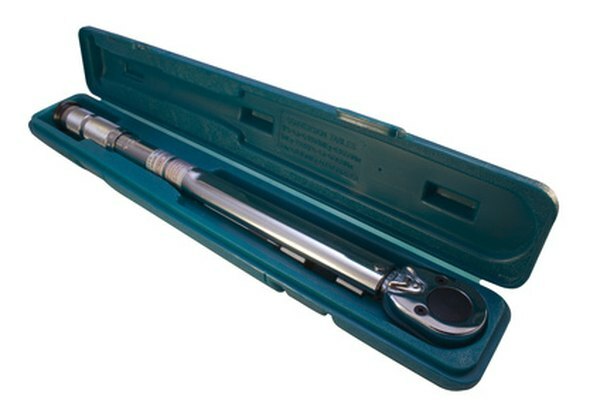 Do not guess; use a torque wrench.